Here’s what it means: Both firms’ results reflect a need to boost engagement among existing mobile users as growth in new users slows. The bigger picture: Mobile banking ubiquity in the US has caused a downturn in new users, forcing banks to find new ways of driving engagement: 89% of respondents to Business Insider Intelligence’s Mobile Banking Competitive Edge Study (enterprise only) said they use mobile banking, up from 83% of respondents in 2017. With an established digital platform, Chase has turned its focus to its physical network. 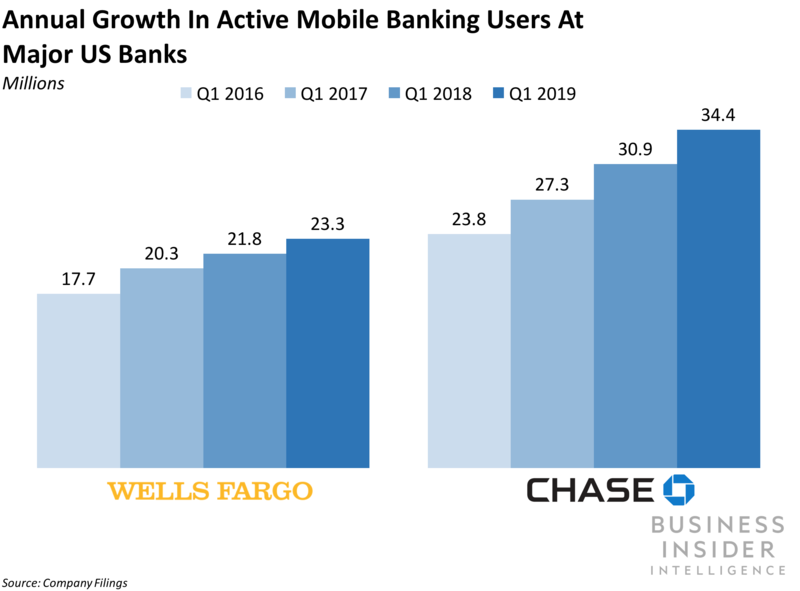 As growth in new users slows, Chase has emphasized its physical network, as branches typically drive account opening. During Q1 2019, Chase began issuingcontactless credit cards with Visa and opened a low-cost account that can allow it to reach a new segment of potential mobile users. At its 2019 Investor Day presentation in February, Chase highlighted an uptick in engagement in digital channels, noting that the average branch teller transactions per customer declined 41% from 2014 to 2018, with the vast majority (80%) of transactions completed through self-service channels like the Chase Mobile app. However, Chase found that 70% of its deposit growth between 2014 and 2018 came from households that frequent branches. The firm responded with plans to open 90 new branches by the end of 2019, in a bid for its physical locations to reach 93% of the US population by 2022.